Founded by Bishop Hugh du Puiset, this "peculiar" has seen over 800 years of history and survived much vicissitude and change. 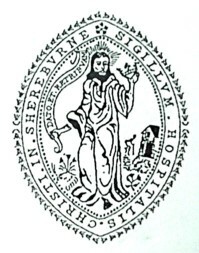 Fifteenth and sixteenth century Hospital statutes provided for clerks and choristers, and there may have been instruments. But it was not until 1869, following a serious fire in 1864, when the church building had been rebuilt with added north aisle to the designs of Austin & Johnson, that the first organ of which we know details was installed. This was built by Wadsworth of Manchester. 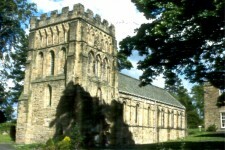 In the 1860's Wadsworth built several organs locally, before the Harrison firm moved from Rochdale to Durham. 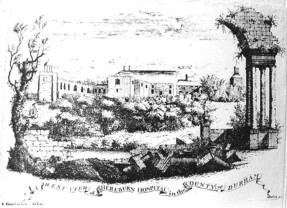 Those in St.Nicholas and St.Margaret, Durham are long since gone, but that at Kirk Merrington (Job No.56 of 1866, costing £200) survives unaltered, very similar in size and content to that installed three years later at Sherburn Hospital. It is an attractive sounding instrument with powerful bright choruses, quaint Flutes, and a curious fretwork casefront. Rohr Flote 4ft, Twelfth 3ft, Fifteenth 2ft, Mixture IIrks, Trumpet 8ft. Spitzflote 8ft, Lieblich Gedackt 8ft, Gemshorn 4ft, Flageolet 2ft, Hautboy 8ft. Couplers: Great organ to Pedals, Swell to Great organ. Wadsworth used the "simplification system" of splayed mechanical action. The press report of the opening on the 3rd January 1869 describes the organ as "a magnificent instrument which has elicited the warmest expressions of approbation from the subscribers". This organ had some stops changed in 1888, by way of improvement, but apparently fell out of favour. Later correspondence at one point refers to it as "noisy"; certainly it was regarded as old-fashioned. The then Master, who seems to have been the prime mover, ordered a brand new organ from Harrison & Harrison of Durham in December 1894. In advance of the arrival of the new, the old organ was transferred by the same firm and installed with new action in Boldon Colliery Wesleyan Church for £130. It lasted there for another 80 years, until it seems it was considered not fit to repair, and was scrapped. In 22 years since the move to Durham Harrison & Harrison had built some 300 organs; 1895 saw 15 new organs produced, all for North of England destinations. So it was not until Christmas a whole year after it was ordered that the new organ - the present instrument - was erected. It has one fewer stop than its predecessor, and was regarded as altogether more up-to-date in taste and design - an early example of the young (then aged 28) Arthur Harrison's voicing. It was described at the time by the firm as having "round, full, dignified [tone], not wanting in power, but also mellow, soft and sweet". The price was £250 plus the old organ. Arthur Harrison played for the Sunday services, by invitation, on 22nd December 1895, and although there are no surviving details, it seems that the Cathedral organist, Dr.Philip Armes, "thoroughly tried the instrument" by giving a recital on the 24th January 1896. In a letter to Harrison the following day, the Master says "he pronounces it a perfect gem...", though with some difficulty with the weight of the handblowing mechanism, "he expressed the highest approval of it". Hydraulic blowing was installed in 1905. This was replaced by the present electric blowing plant costing £78/15/-, and the organ was cleaned and restored for £121, early in 1931. The relics of the water engine may be seen exhibited at the Ryhope Waterworks Museum. Repairs to cure problems of overheating were effected in 1944. In 1984 Messrs.Brighton & Davison of Durham thoroughly overhauled the instrument, removing 50 years of dust and dirt, transforming the speech of the pipes and feel of the actions, revitalising the organ's use and worth in advance of its centenary and into the next century. The opportunity was taken to make two relatively minor, indeed reversible, changes to the stoplist. These were not intended in any way seriously to alter its character or detract from its integrity as a soundly-built Harrison & Harrison organ, typical of its age. 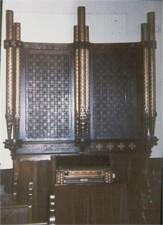 The Swell Voix Celeste (which correspondence shows to have been preferred for a Piccolo at a late stage in construction in 1895) was perhaps something of a luxury on an organ of this size. A full compass 2ft tapered rank (named Flageolet) offering greater versatility has replaced it. Also the Pedal 16ft Open Wood was ponderous and slow in speech. It's promptness could have been improved only marginally, so instead, the bottom octave of pipes has been disconnected and a continuing upper octave of open wood flute pipes provided as a Open Bass 8ft of greater utility. The organ re-opening concert on 23rd October 1984 was given by Richard Lloyd of Durham Cathedral, who also accompanied Kim Jones as Baritone soloist. Compass: Manual CC to a (58 notes), Pedal CCC to F (30 notes). Mechanical action to manuals, pneumatic to Pedals. Wind pressure 23/4" Swell box thickness 21/2"
with Richard Hird, Sherburn Hospital organist, and The Durham Singers, directed by Alan Oyston.